Computer scientists have dreamt of large-scale quantum computation since at least 1994 -- the hope is that quantum computers will be able to process certain calculations much more quickly than any classical computer, helping to solve problems ranging from complicated physics or chemistry simulations to solving optimization problems to accelerating machine learning tasks. One of the primary challenges is that quantum memory elements (“qubits”) have always been too prone to errors. They’re fragile and easily disturbed -- any fluctuation or noise from their environment can introduce memory errors, rendering the computations useless. As it turns out, getting even just a small number of qubits together to repeatedly perform the required quantum logic operations and still be nearly error-free is just plain hard. But our team has been developing the quantum logic operations and qubit architectures to do just that. In our paper “State preservation by repetitive error detection in a superconducting quantum circuit”, published in the journal Nature, we describe a superconducting quantum circuit with nine qubits where, for the first time, the qubits are able to detect and effectively protect each other from bit errors. This quantum error correction (QEC) can overcome memory errors by applying a carefully choreographed series of logic operations on the qubits to detect where errors have occurred. 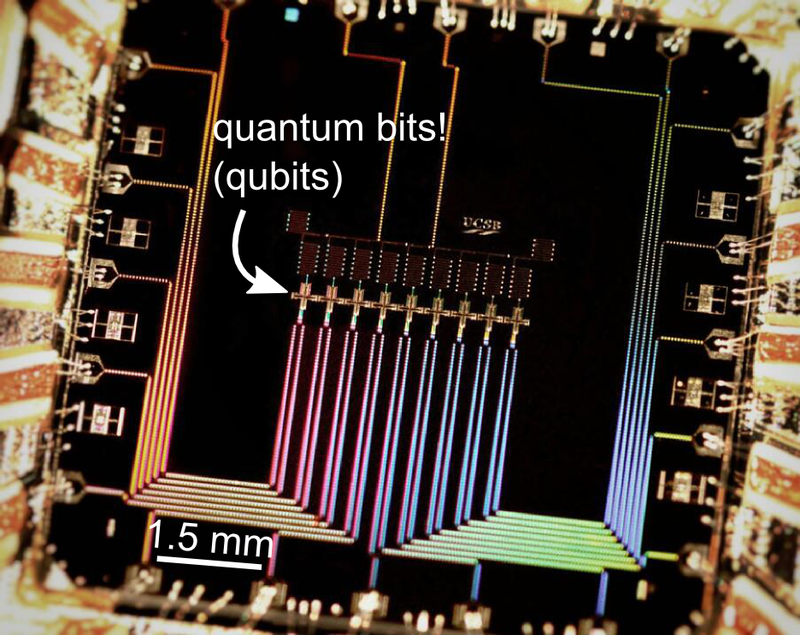 Photograph of the device containing nine quantum bits (qubits). Each qubit interacts with its neighbors to protect them from error. So how does QEC work? In a classical computer, we can monitor bits directly to detect errors. However, qubits are much more fickle -- measuring a qubit directly will collapse entanglement and superposition states, removing the quantum elements that make it useful for computation. To get around this, we introduce additional ‘measurement’ qubits, and perform a series of quantum logic operations that look at the 'measurement' and 'data' qubits in combination. By looking at the state of these pairwise combinations (using quantum XOR gates), and performing some careful cross-checking, we can pull out just enough information to detect errors without altering the information in any individual qubit. The basics of error correction. ‘Measurement’ qubits can detect errors on ‘data’ qubits through the use of quantum XOR gates. We’ve also shown that storing information in five qubits works better than just storing it in one, and that with nine qubits the error correction works even better. That’s a key result -- it shows that the quantum logic operations are trustworthy enough that by adding more qubits, we can detect more complex errors that otherwise may cause algorithmic failure. While the basic physical processes behind quantum error correction are feasible, many challenges remain, such as improving the logic operations behind error correction and testing protection from phase-flip errors. We’re excited to tackle these challenges on the way towards making real computations possible. Discovering new treatments for human diseases is an immensely complicated challenge; Even after extensive research to develop a biological understanding of a disease, an effective therapeutic that can improve the quality of life must still be found. This process often takes years of research, requiring the creation and testing of millions of drug-like compounds in an effort to find a just a few viable drug treatment candidates. These high-throughput screens are often automated in sophisticated labs and are expensive to perform. Recently, deep learning with neural networks has been applied in virtual drug screening1,2,3, which attempts to replace or augment the high-throughput screening process with the use of computational methods in order to improve its speed and success rate.4 Traditionally, virtual drug screening has used only the experimental data from the particular disease being studied. However, as the volume of experimental drug screening data across many diseases continues to grow, several research groups have demonstrated that data from multiple diseases can be leveraged with multitask neural networks to improve the virtual screening effectiveness. In collaboration with the Pande Lab at Stanford University, we’ve released a paper titled "Massively Multitask Networks for Drug Discovery", investigating how data from a variety of sources can be used to improve the accuracy of determining which chemical compounds would be effective drug treatments for a variety of diseases. In particular, we carefully quantified how the amount and diversity of screening data from a variety of diseases with very different biological processes can be used to improve the virtual drug screening predictions. Using our large-scale neural network training system, we trained at a scale 18x larger than previous work with a total of 37.8M data points across more than 200 distinct biological processes. Because of our large scale, we were able to carefully probe the sensitivity of these models to a variety of changes in model structure and input data. In the paper, we examine not just the performance of the model but why it performs well and what we can expect for similar models in the future. The data in the paper represents more than 50M total CPU hours. 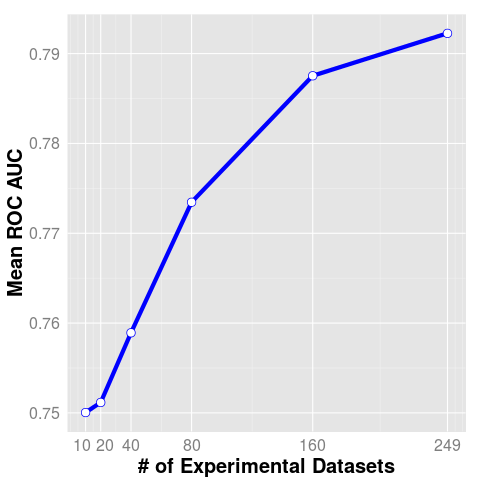 This graph shows a measure of prediction accuracy (ROC AUC is the area under the receiver operating characteristic curve) for virtual screening on a fixed set of 10 biological processes as more datasets are added. One encouraging conclusion from this work is that our models are able to utilize data from many different experiments to increase prediction accuracy across many diseases. To our knowledge, this is the first time the effect of adding additional data has been quantified in this domain, and our results suggest that even more data could improve performance even further. Machine learning at scale has significant potential to accelerate drug discovery and improve human health. We look forward to continued improvement in virtual drug screening and its increasing impact in the discovery process for future drugs. Thank you to our other collaborators David Konerding (Google), Steven Kearnes (Stanford), and Vijay Pande (Stanford). 2. Dahl, George E, Jaitly, Navdeep, and Salakhutdinov, Ruslan. Multi-task neural networks for QSAR predictions. arXiv preprint arXiv:1406.1231, 2014. 3. Ma, Junshui, Sheridan, Robert P, Liaw, Andy, Dahl, George, and Svetnik, Vladimir. Deep neural nets as a method for quantitative structure-activity relationships. Journal of Chemical Information and Modeling, 2015.